Anglia first distributed Intersil (who were recently acquired by Renesas) in 2008, offering a range of innovative power management and precision analogue solutions successfully for a decade. To mark the occasion, the team from Anglia and Renesas met for a special dinner at Jason Atherton's contemporary Pollen Street Social restaurant in London. Peter Jeutter, senior director sales EMEA at Renesas Electronics Europe GmbH explained, "Anglia’s deep technical expertise and outstanding logistical service has been a factor in expanding first Intersil’s and then Renesas’ presence in the market in the UK and Ireland. 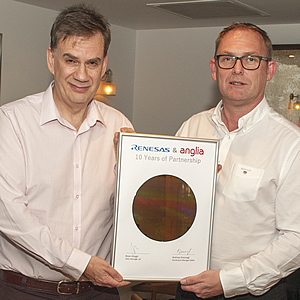 We’d like to congratulate Anglia for 10 years and look forward to many more." Steve Rawlins, CEO at Anglia, commented, "We have enjoyed a close and successful relationship with Intersil and Renesas since their acquisition. Last year saw a significant expansion of our product portfolio which helped strengthen our relationship with all of our customers, and reinforced us as a strategic supplier offering a broad base of solutions." Anglia supports Renesas product ranges including the innovative Renesas Synergy™ Platform, microcontrollers, mixed signal ICs and System on Chip devices on Anglia Live, for same day shipment from stock. Anglia have trained members of its Field Application Engineering team to support Renesas devices and technologies. The Intersil range of innovative power management and precision analogue solutions is already well supported by the Anglia team and on the Anglia Live site. Photo caption: Left to right - Brian Gough, Regional Sales Manager UK and Ireland, Renesas Electronics, John Bowman, Marketing Director, Anglia.